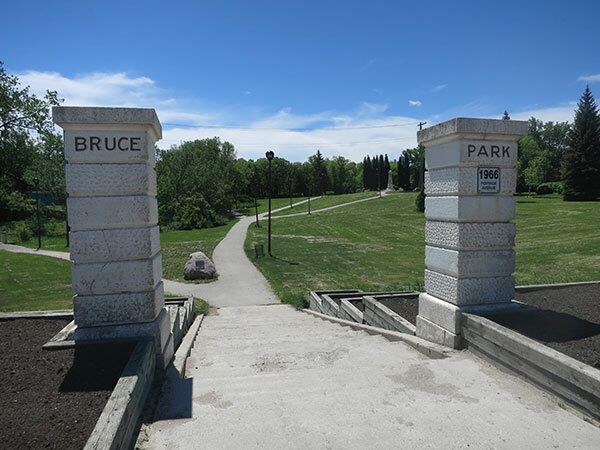 This park in the St. James area of Winnipeg was named for farmer Peter Bruce (1836-1928) who resided here until his death. In 1933, his family donated the land to the city with the condition that it always remain public green space. Its history was re-discovered in 2004 by ten-year-old Bailey Herron during his research for a genealogy project. A City of Winnipeg plaque, located at the north entrance to the park on Portage Avenue, was unveiled by Herron and Winnipeg city councillor Jae Eadie on 27 August 2004. Inside the park is a cenotaph commemorating those from St. James killed during military service. Death registration [Peter Bruce], Manitoba Vital Statistics. “Deaths,” Manitoba Free Press, 29 June 1928, page 26. “Ten-year-old discovers it’s his ‘great-great-great-great uncle’,” Winnipeg Free Press, 28 August 2004, page B7.